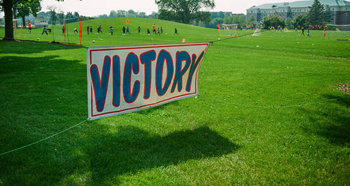 Victory Sports is a 36 year old Sports Ministry Organization located in Du Page County. Using 16 different sports, Victory Sports has year round programs including Summer Sports Camps for Kids ages 3-14. Summer Camps include: Basketball Camps, Soccer Camps, Football Camps, Fishing and Canoeing Camps, Volleyball Camps and Golf Camps. In addition to Summer Camps, Victory Year-round Programs include: Home School, Preschool, After School Sports, Soccer and Basketball Leagues, Tournaments and Sports Clinics. You can expect a week you won’t forget. Our goal is to provide an environment for children to learn the sport in an atmosphere of care and understanding. Each child will be treated equally and fairly. Instruction is age and developmentally appropriate. Daily Challenge-Times will incorporate demonstrations of the sport. These times will also include dramas, stories and lessons told from a Christian perspective. We would like to invite the entire family to attend the last half hour of camp on the final day for a special treat and an awards presentation. For more information and to register, you can go to www.playvictorysports.com, or call 630-212-8544.